Photodocumentation of the mural was performed in 1990 by photographer, Nancy Kaye in conjunction with the first phase of conservation. This was followed by a complete digital capture and tiling of the mural in 1993 by GCI Fellow, Eric Lange. Over time, the GCI has monitored and recorded the condition of the mural. In 1997, 2002, and 2012, condition assessments of the mural by GCI conservators and documentation specialists were performed. Graphic documentation was carried out on site both manually and with tablet computers to record technique of execution, conditions, previous interventions, treatments by the GCI and post-treatment monitoring. Maps were created with computer-aided drafting software to be used as baseline information and for comparison to monitor change over time. Written reports document conditions as well as materials and methods used for treatment at every stage of the project. Video documentation captured different phases of the project. 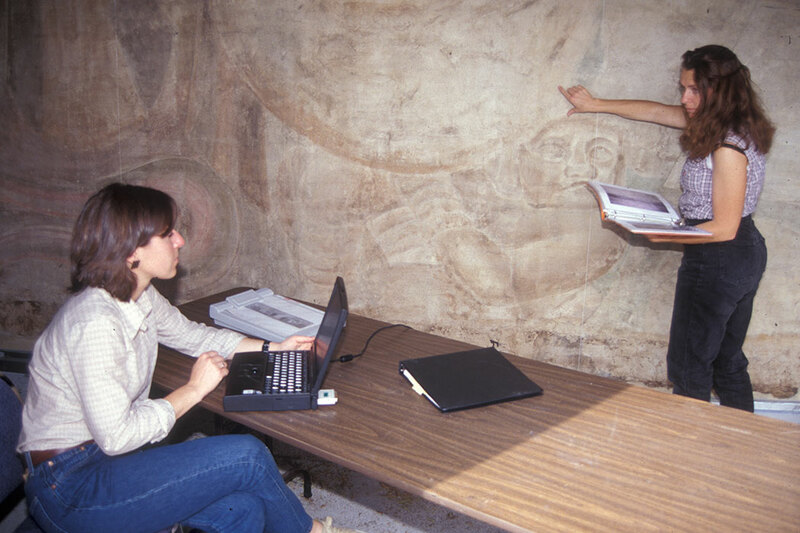 Conservators Irene Sen and Angelyn Bass record specific conditions of the mural as part of a 1997 condition survey. Photo: Leslie Rainer/GCI. Mural: © 2012 Artists Rights Society (ARS), New York/SOMAAP, Mexico City. Example of the graphic documentation showing techniques of execution, conditions, and previous interventions.